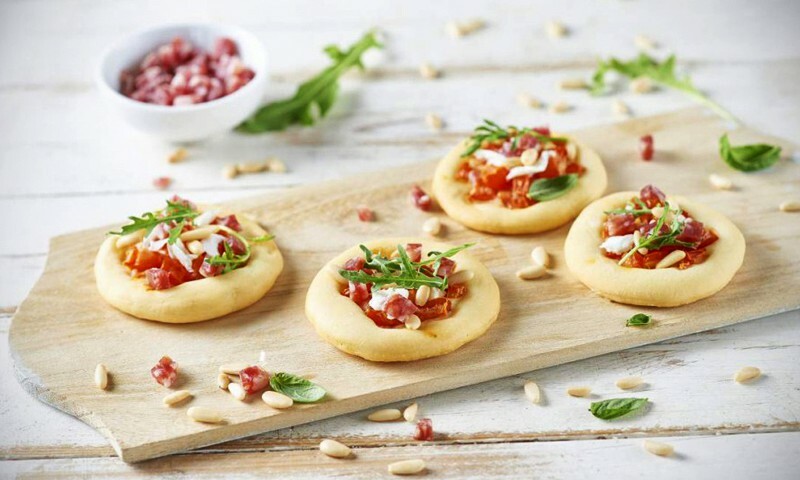 These amazingly cute and delicious mini pizzas are so easy to make and a great idea for afternoon snacks or party finger-food! 1. Mix the flour, 1 teaspoon of salt and the yeast, adding 1 teaspoon of sugar to activate it. 2. Add in 1 tablespoon of oil and start kneading using your hands. Continue until a homogenous; leave to rise and cover with a cloth until the volume has doubled. 4. Transfer the pizza to a baking tray covered with baking paper and leave to rest for about 15 minutes. In the meantime, cut the tomatoes into cubes, drain and toast the pine nuts in a pan. 5. Press down the centre of the pizzas with one finger and fill with the diced tomatoes and a drizzle of oil. Cook at 180°C for about 15 minutes. 6. Add the mozzarella once cubed, the rocket, the chopped salami and pine nuts. Serve with fresh basil.